Since 1936, the Waukegan Band has provided the community with high quality music each summer. 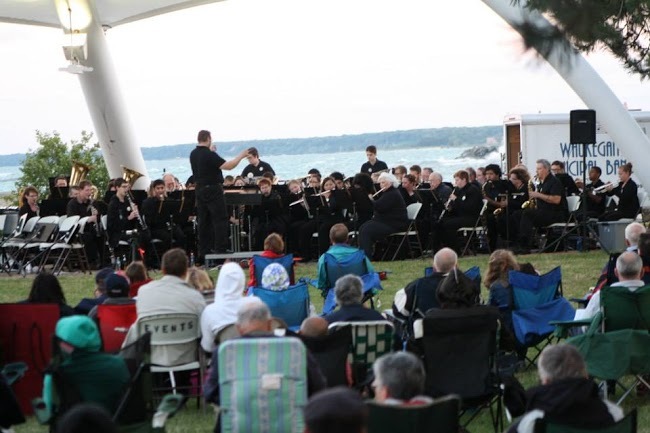 Weekly concerts are held at the Stiner Pavilion on the beautiful shores of Lake Michigan and our concertgoers enjoy free admission and free parking. It is only the generosity of foundations, corporations, and individuals that sustain us and help us offset various costs that include purchasing music, performance licensing, advertising, printing, staffing for band duties, and purchasing and repairing instruments and equipment. The financial generosity of individuals like you allows us to share outstanding musical experiences with concertgoers, local students, and countless community members. Do you have a friend, a parent, a child, a neighbor, a teacher, a spouse or relative who was "instrumental" in your life? We'll share your memorial to their contribution. If you choose to dedicate your donation to a family member or to honor a friend, please advise us of memorializing by contacting us at waukeganband@gmail.com and make a note in the memo of your online or check donation. Thank you for your kind support! Does your employer offer a "Matching Gift" or "Volunteer Grant" program? A majority of the "Fortune 500" companies and community leaders do. Check with your employer's Human Resource Department. The Waukegan Band has been fortunate to benefit from generous donors doubling their contributions through submitting to these charitable corporate efforts. Our most visible form of support is through our corporate sponsors. By sponsoring the Waukegan Band, businesses can enrich the local cultural community and will receive advertisement recognition in our program and a website link on the Waukegan Band’s website. We welcome monetary donations as well as gift donations for our weekly concert raffles. For more information on corporate sponsorships and website advertisements, please contact us using the button below. From time to time, we are in need of a volunteers to help us with various events or non-musical tasks. Some of these activities include handing out raffle tickets or programs at the front table of each concert as our audience members arrive. We also welcome anyone that would be willing to help us distribute yard signs, help with fundraising events, or collect raffle items for our weekly raffle drawing. Interested in volunteering your time for the band? Please reach out to us using the button below! ​The Waukegan Band Foundation is a non-profit, tax exempt, 501(c)3 organization. Your gift is tax deductible to the fullest extent allowed by law. Click on the Charity Navigator image for more information as needed for your tax filing requirements. We ask that donations intended and eligible for advertisement in our season-long program be received by May 28 of each year to permit lead time preparation at the printer. Thank you for your understanding. We do not sell donor contact information out of respect for your privacy. As a seasonal nonprofit, our operating year is from September 1st through the following August 31st.